Despite the disruption in oil and natural gas production due to Hurricane Harvey in some of the affected areas and the increased geo-political tension in Asia recently, the oil price is still stuck below $50/barrel. The prolonged supply-demand imbalance in the oil markets is causing crude prices to stay low for a longer period of time, benefiting downstream operations due to lower feedstock costs and spurring demand for petrochemicals. As a result, many companies are expanding their ethylene cracker operations to capitalize on the strong demand. Ethylene is the most produced petrochemicals today as it is the basic building block for a wide range of materials used in manufacturing. As the production process is highly complex and energy intensive, any improvement in process design and operations can significantly improve operating margins, resulting in higher ROI. According to a Deloitte’s study, it was determined that “digital initiatives concentrated on operational and commercial excellence are considered to have the highest impact”.1 In addition, Big data and advanced analytics are ranked one of the top 3 capabilities required to monetize digital initiatives. 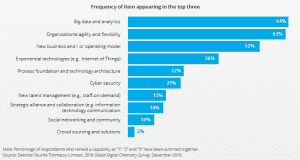 (“Digital Transformation: Are chemical enterprises ready?” January 2017). Utilizing advanced analytics and process simulation tools to optimize designs and operations have become the only option to succeed in today’s volatile environment. In order to stay relevant for the next few years, companies must continue to improve their operations to reduce costs, and gain organizational agility to respond to changing feedstock availability and product demand without incurring higher CAPEX investment. Process simulation tools are not only useful for optimizing process designs during Front End Engineering Design stage (FEED) but also enable debottlenecking of existing plant for improved efficiency and throughput. As optimizing plant process design involves several phases, seamless integration of various simulation designs, including heat and material balances, hydraulic and sizing calculations and abnormal simulation scenarios is crucial to achieve optimal design during the entire process. An effective simulation-driven engineering platform will have the ability to combine design and simulation, while streamlining workflows, improving collaboration and reducing engineering costs and time as a result. The dynamic process modeling used in the design process can also be integrated into an Operator Training System (OTS), enabling field and DCS operators to be trained in a 3D virtual plant environment so that they could get up to speed immediately after the commissioning of the new plant. 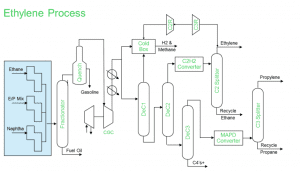 Most modern ethylene crackers are designed for feedstock flexibility, allowing the supply chain planner to purchase the type of feedstock based on economics and availability. Sourcing the cheapest type of feedstock in the market may not necessary maximize a plant’s operating margins as the increased operation costs of processing may outweigh the initial saving; most existing supply chain platforms do not have the capability to integrate refining and petrochemical operations into their planning, resulting in weak collaboration and loss in opportunities. 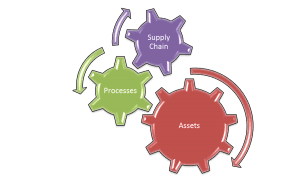 Digitalizing supply chain operations with an integrated supply chain management platform enables planner to source for the most profitable feedstock through unifying feedstock trading to production planning, scheduling and operations execution, breaking down information silos and optimizing the entire network. Operating at optimal process conditions during production can contribute greatly to the bottom-line, increasing throughput and yield while reducing utility consumption. As the optimal operating process conditions may vary greatly due to changes in environment ambience, types of feedstock and product requirements, digitizing the operations with Real-Time Optimization (RTO) analytics can automate re-calibration of the process model and help ensure optimized operating conditions 24/7 based on the prevailing conditions. As the ethylene plant runs a diverse set of complex assets to produce petrochemicals, reducing unplanned shutdowns due to equipment failures can potentially help save millions of dollar a year. Digitalizing the assets with predictive analytics enables maintenance team to read into the health and performance of assets, allowing them to predict equipment failures before they happen, minimizing unnecessary shutdown that can cost millions of dollars. Through digitizing process design, supply chain, operations and assets with advanced analytics, companies have shown to reap significant improvement in their operating performance, enabling them to succeed in today’s highly competitive market. They are now able to make better and informed decisions through contextual actionable insights, and improve ROI through better asset utilization. Watch our on-demand webinar to gain insights on how leading petrochemical plants apply digital technology to help them succeed in this challenging environment. How Digitalization of Production Allocation Maximizes Throughput in Oil Fields How Digital Operations Management Improves Profitability in this Challenging Oil and Gas Environment Reduce Total Cost of Ownership with Process Design in the Cloud Was Your First Day on the Job Nothing Like College?